Sea Palling lies on the Norfolk coast between Waxham and Eccles. It consists of an odd assortment of bungalows, caravans, cottages, amusement arcades and chalets which all crouch behind the line of the dunes. It is still a popular resort with holiday-makers, locals and jet-skiers. On the night of the 31st January, 1953 the North Sea broke through the dunes here and the incursion killed 7 people, destroyed many homes and ruined thousands of acres of farmland; it was the worst flood in living memory. The following year saw the construction of the sea wall. The land behind the dunes - which includes Hickling Broad and Horsey Meer - is very low lying and could easily be reclaimed by the sea. 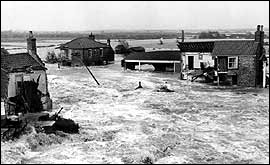 In the event of such a disaster, towns like Stalham, Potter Heigham and Martham could all become coastal resorts. The cost of maintaining sea defences is high and, even today, Natural England are ambivalent about fighting the fight. However, in recent years the defences at Sea Palling have been strengthened by importing rocks from Norway which now provide an additional barrier to the waves. Behind them have formed lagoons which have proved popular with visitors to the beach. On a lighter note Sidney Grapes, writing as The Boy John, mentions Sea Palling in one of Aunt Agatha's wonderful postscripts: 'P.S. - Aunt Agatha, she say "Mirages dew still happen," for she was a-picken a' oranges on Porlin beach a Christmas mornin!' The oranges in question were part of the cargo of 'The Bosphorus' which foundered on Haisborough Sands in Decemeber 1948. For Norfolk people used to wartime rationing - this was a particularly welcome event.